It’s freezing cold. 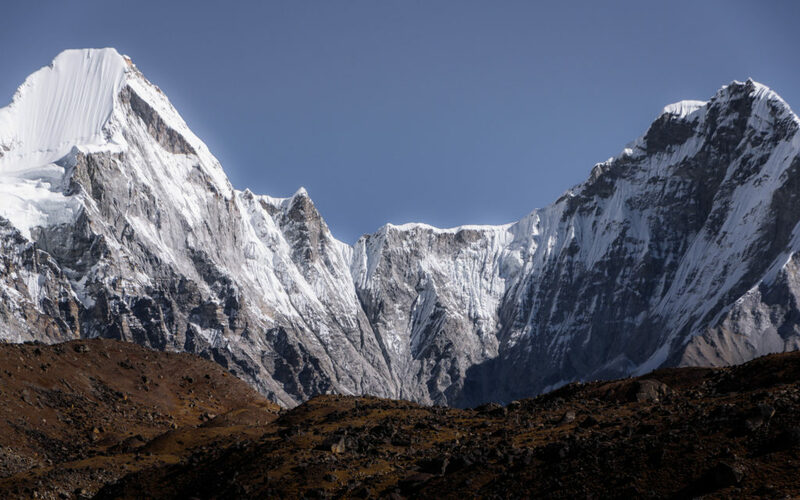 As I open my eyes, the sun has still not risen because Dingboche is caught in the web of Ama Dablam’s morning shadow. As a result, our bedroom’s windows are still frosted over. I had a fitful night’s sleep and a nose bleed to boot. Today we say goodbye to Des, Hein, Chris and one of the guides, Asmit. 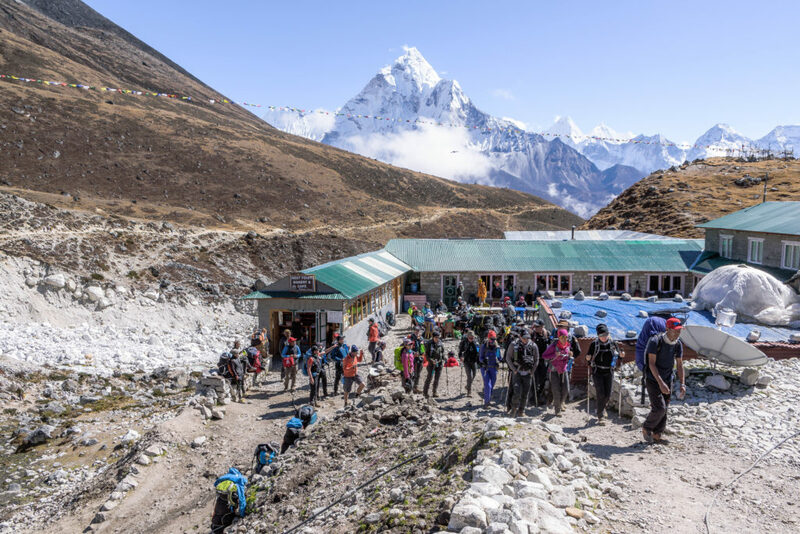 Dingboche is their turnaround point. Going forward our group now consist of Ryan, Umberto, Wayne, myself and our guide Nga-wang. 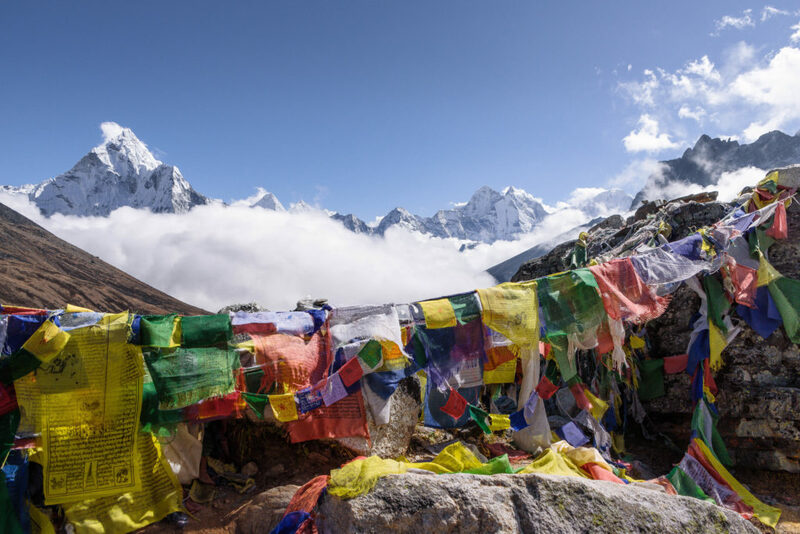 The Dingboche (14 465 ft) to Lobuche (16 105 ft) trek is 12km long, with a vertical gain of 500 meters and it should take 6 hours to complete. 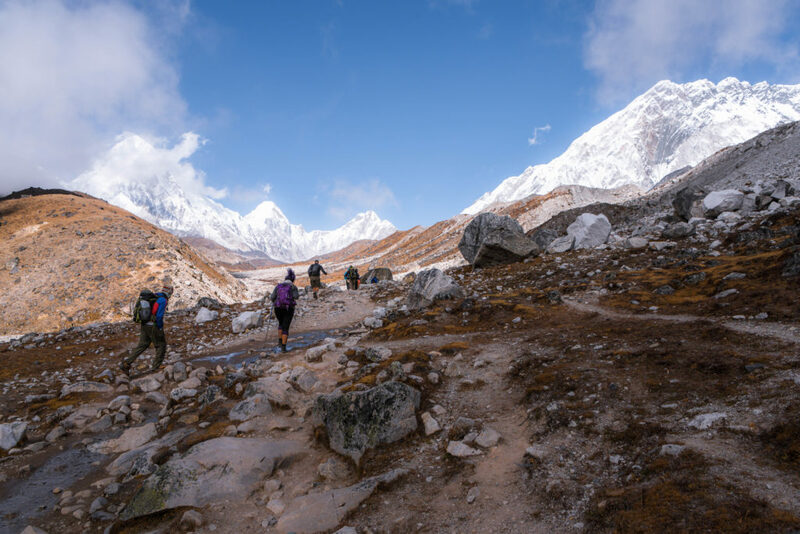 This stretch of the trek is a definite highlight. 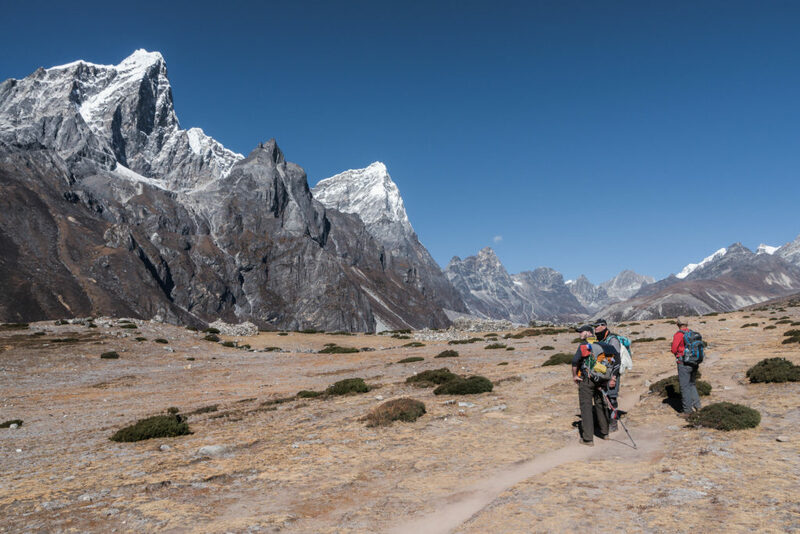 Soon after leaving Dingboche, the Tabuche and Cholatse peaks rise, to our left, 2 000 vertical meters above us. It is a tremendous sight. Our pace is slow as Wayne and I constantly take photos but a biting cold wind on our backs does hasten us along. Too big to not take a panorama. Pheriche, bottom left. 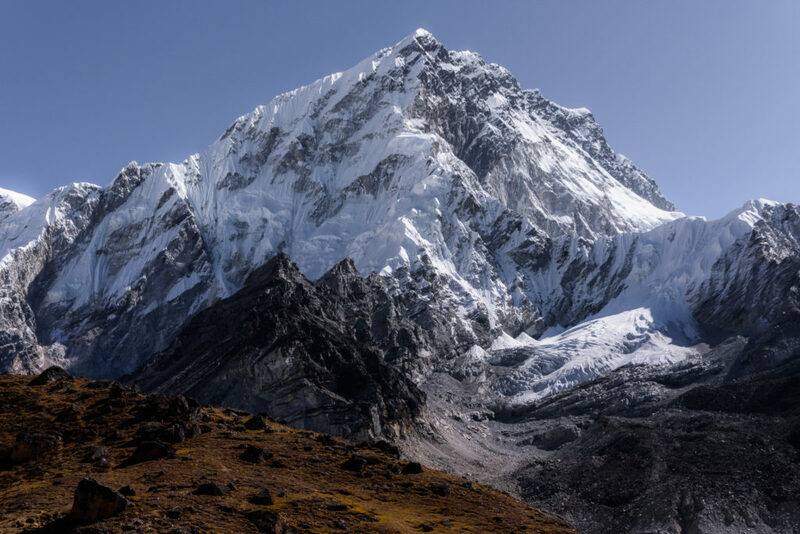 Peaks from the left: Kangtega (6685m), Thamserku (6608m), Tabuche (6367m) and Cholatse (6335m). As on every other trekking day the hiker traffic is busy at the start of the route. 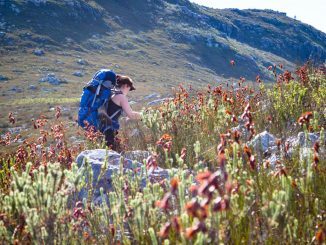 The trail has a gradual upslope and criss-crosses the wide grassland. Yaks love to graze here. The uphill gradient is agreeable, as long as you don’t push too hard. After an hour’s hike we sit down to marvel at the view in front of us and have a snack. 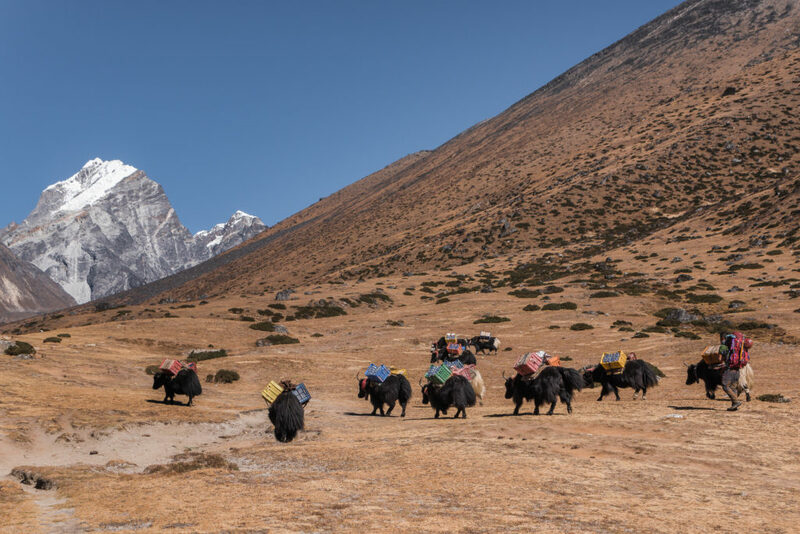 Yaks making their way to Dhugla. Lobuche East on the left. As we get closer to Dughla (4620m) the Chola Tsho glacial lake at the foot of Cholatse comes into view. Unlike anything I’ve seen before, the lake has a unique milk-ish aqua colour. 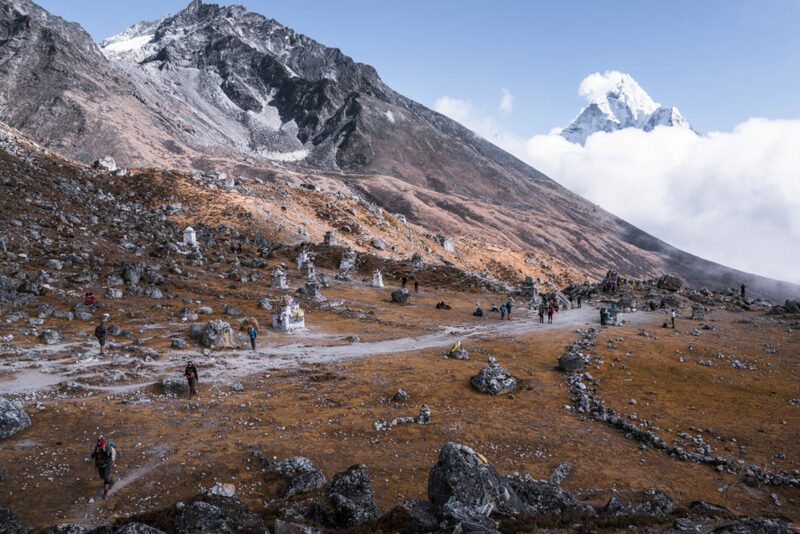 It formed when the Cholatse glacier moraine pushed rocks into the path off the glacial melt water running down from Cho La pass. 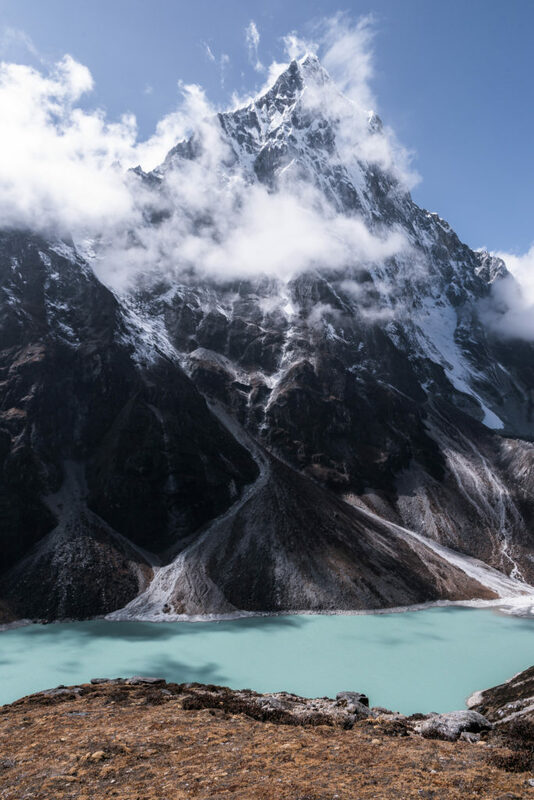 The colour contrast between the aqua-coloured lake, Cholatse’s pitch black rock interspersed with snow white ice and the cobalt blue sky is glorious. Soon we have to pass through the Dudh Koshi moraine to have lunch at Dhugla. On the far side, across the moraine, I can see the Thokig pass snaking up towards 4830m. It’s only a 200-metre vertical altitude gain, but the sight of it saps my confidence. At this altitude it’s going to be hard work. For lunch I have macaroni and cheese and a steaming hot orange tea. It’s getting colder as mist moves in from the valley below. My strategy for Thokig pass is to go at it relentlessly. I tell myself the less I stop the faster I’ll get to the top. The gradient is brutal. Umberto seems unfazed and very relaxed as he scrambles past me up the rock path. I tell myself it’s because he doesn’t have a camera to carry. The uphill struggle seems never ending, but after half an hour of climbing we’re at the top. A miserable cold wind greets us at the top of the pass. The view back down the valley is wondrous. Only the high peaks peek through the rolling mist clouds. Wayne, who has been here numerous times before, gives us a brief background of the memorial to dead climbers and sherpas. I stumble upon the Kazakhstan climbers’ memorial and see the name of Anatoli Boukreev. He was very much at the centre of the 1996 Everest disaster, to only die a year later in an avalanche on Annapurna. After resting a while, the frigid wind moves us briskly along and we enter a new, breath taking world which consists of rock, water, ice, wind and precious little oxygen. It’s the Khumbu Glacier. The glacier is to our right but we can’t see it due to us walking in a shallow valley on the western side of it. 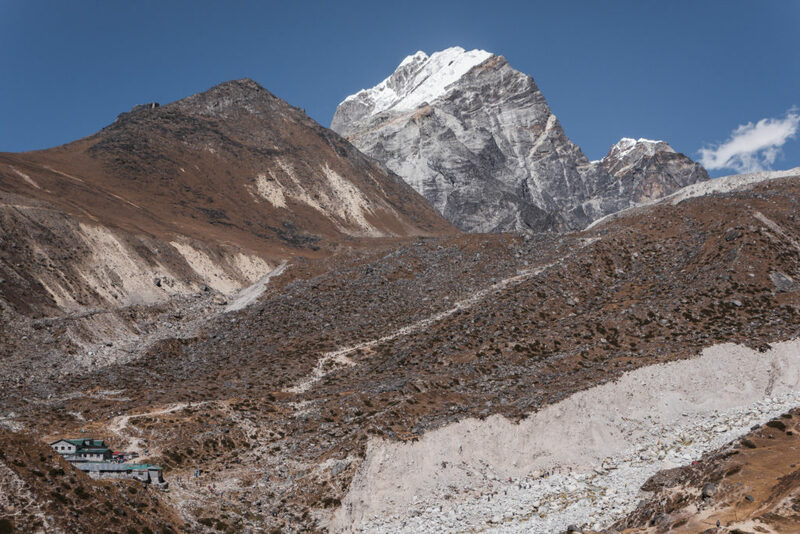 Soon Pumori (7165m), Lingtren (6749m), and Nuptse (7861m) make their appearances. 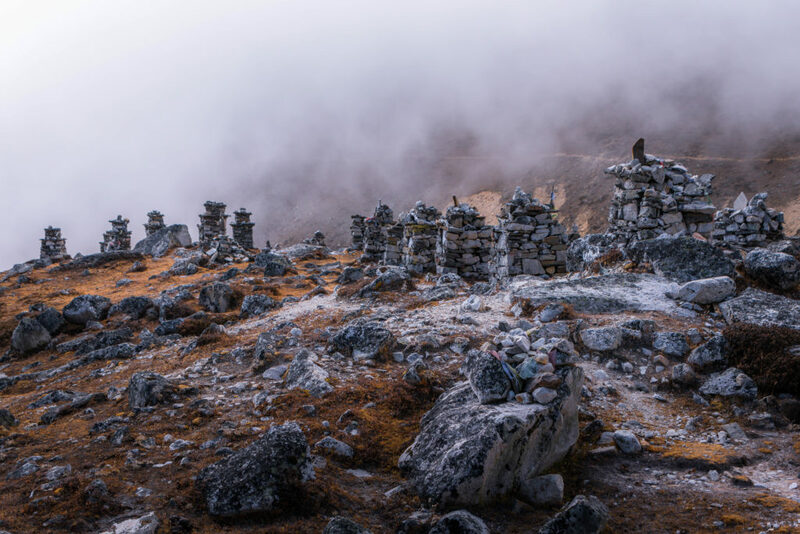 An amphitheatre of rock and chiselled ice eight kilometres ahead signal the turning point of our trek and the border between Nepal and Tibet. We’ve arrived at the top of the world. Two hours later we trudge into Lobuche. Our lodge, the Hotel Peak XV, isn’t brilliant. Our room on the second floor is small. The whole building is constructed from flimsy materials. Each movement and step, wherever it might be in the building, is heard and felt. It’s noisy. It’s easy to follow conversations next door. The toilets are a mess with water spilled all over the cubicles. The tea room is stuffy and crammed. Water is expensive. Maybe I’m not feeling too well? I do feel irritated and restless. I don’t recognise it but the altitude gained affects my mood. After afternoon tea I go lie on my bed. I’m too tired to even take off my hiking boots or wet clothes. I can’t fall asleep. 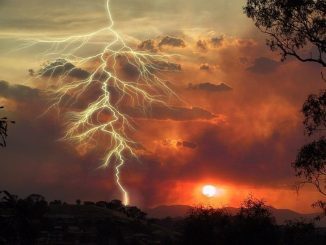 The moment my body relaxes I suddenly gasp for air, which wakes me up and the whole sequence starts again. Exasperated I finally force myself out of bed to wash before night falls and it becomes too cold to change clothes. Washing is a dreary affair with wet wipes. It’s too cold and too expensive to take the risk of a cold shower. It’s now five days since I’ve had a proper wash.
After sharing a room with Des for the first section of the trek I now share with Wayne. I’m lucky on this trip. Neither he nor Des snores. Wayne is a colourful, affable character. 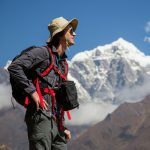 He’s always busy with something, talks a lot, is a bottomless pit of information and has a real passion for the Himalaya because he’s infatuated by its grandeur, mystique and ever-changing landscapes. He’s also an avid birder. It’s comforting to have someone like him with so much experience on the team. Very few things get him down and he’s always joking around. A breath of positivity really helps in these trying conditions. Three dudes just chilling between the clouds. Wayne, Ryan and Umberto. As I lie in bed after dinner I can’t help to pine for my luxuries. First prize would be a decent toilet and uninterrupted sleep. 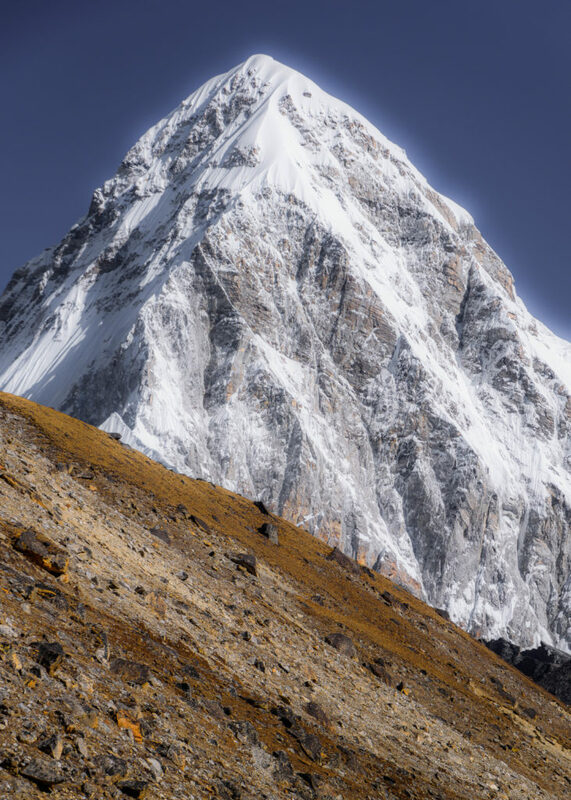 Tomorrow it’s upwards and onwards to Gorak Shep and Everest Base Camp. Although I’m surrounded by unsurpassed natural beauty I realise that my body is now in a battle for survival. The next few days will be tough. 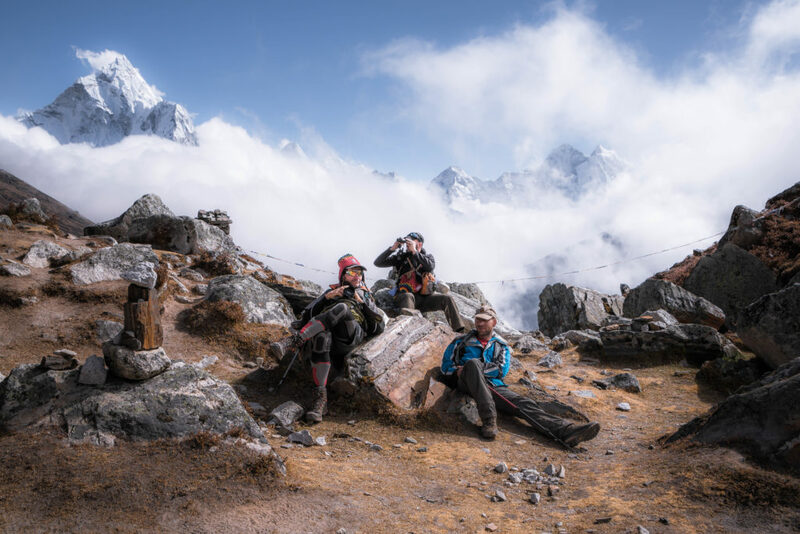 Click here for Part 1, and here for Part 2, and on the link below for the final installment of Eksteen’s Himalayan journey. Eksteen hails from a farm on the flat Highveld near Ermelo, Mpumalanga. He was first introduced to hiking during his varsity days; taking on the Amphitheatre chain ladder trail with takkies, a 30kg backpack and an army stretcher to sleep comfortably. 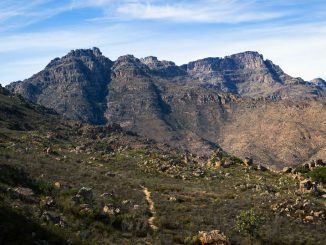 Within a few steps he realised how underprepared he was but the bug bit and he's since climbed numerous passes in the northern Drakensberg between Cathedral Peak and the Chain Ladder, most notable Ifidi pass. It’s also in the mountains where his interest for landscape photography developed. 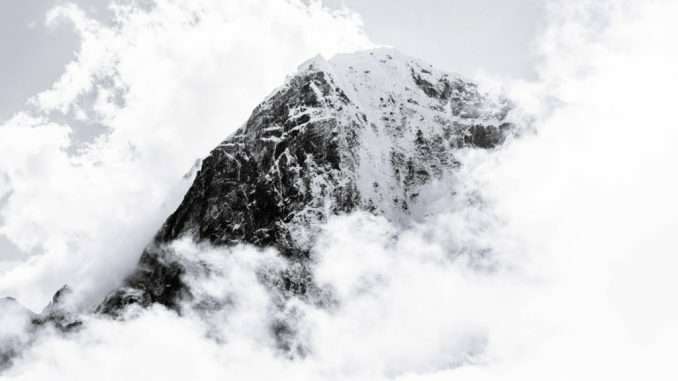 The challenge to portray the vastness and beauty of mountains on a photograph is what he really enjoys. I like that you edited that from ‘VERY hard’ to ‘impossible 🙂 haha. Thank you for sharing – must have been an incredible, once-in-a-lifetime experience. It’s certainly inspired me!